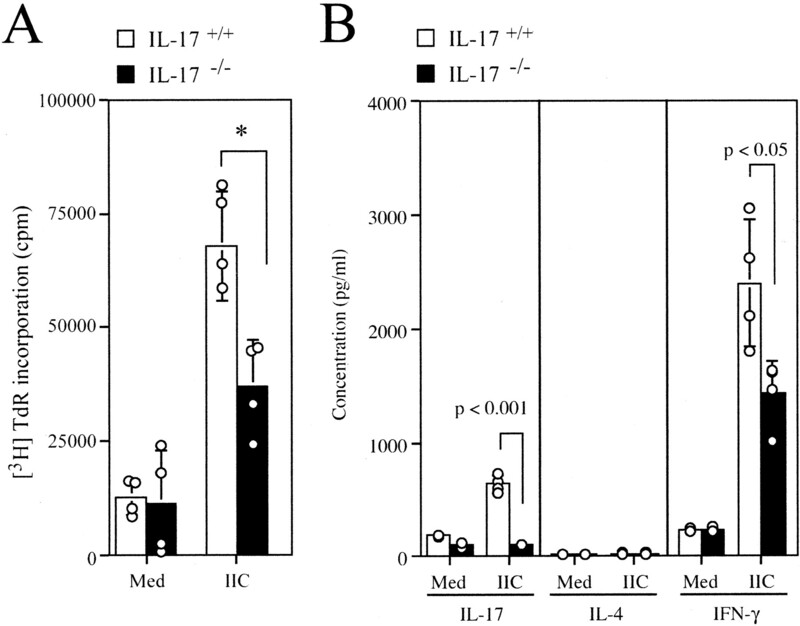 Interleukin-17 is a T cell-derived proinflammatory cytokine. This cytokine is suspected to be involved in the development of rheumatoid arthritis (RA) because this cytokine expression is augmented in synovial tissues of RA patients. The pathogenic roles of IL-17 in the development of RA, however, still remain to be elucidated. In this study, effects of IL-17 deficiency on collagen-induced arthritis (CIA) model were examined using IL-17-deficient mice (IL-17−/− mice). We found that CIA was markedly suppressed in IL-17−/− mice. IL-17 was responsible for the priming of collagen-specific T cells and collagen-specific IgG2a production. Thus, these observations suggest that IL-17 plays a crucial role in the development of CIA by activating autoantigen-specific cellular and humoral immune responses. Rheumatoid arthritis (RA) 4 is one of the most serious medical problems, affecting ∼1% of all people worldwide, irrespective of race. The disease is autoimmune in nature and characterized by chronic inflammation of the synovial tissues in multiple joints that leads to joint destruction, but the etiopathogenesis has not been elucidated completely (1). Various disease models for RA have been developed, and collagen-induced arthritis (CIA) is one of the well-established models (2). CIA can be induced in susceptible rodents by intradermal injections of homologous or heterologous native type II collagen (IIC), a major component of cartilage Ags. Susceptibility for the disease is dependent on MHC class II haplotypes, and only mice with H-2q and H-2r haplotypes respond to immunization with IIC and develop arthritis (3). Recently, however, it is reported that CIA can also be induced on C57BL/6 (H-2b) mice by repeated administration with IIC intradermally (4, 5, 6). The development of CIA is dependent on both cellular and humoral immune responses to IIC (6), and various cytokines are thought to play crucial roles in the pathogenesis through the activation of immune system (6, 7). A T cell-derived proinflammatory cytokine, IL-17 is produced by TCRα/β+CD4−CD8− thymocytes, as well as activated CD4+ and CD4+CD45RO+ memory T cells (8). The producer cells of IL-17 also express TNF-α, but not Th1 or Th2 cytokines, in mice (9). IL-17 has pleiotropic activities, including induction of TNF-α, IL-1β, IL-6, IL-8, G-CSF, and monocyte chemoattractant protein-1 on various types of cells (8). Involvement of IL-17 in the development of RA is suggested, because IL-17 is found in the synovial fluid of RA patients (10) and is produced by T cell clones established from RA patients (11). Actually, the incidence of arthritis reduced partially by the administration of an extracellular domain of IL-17R-Fc fusion protein (IL-17R:Fc), which inhibits IL-17-IL-17R binding, in the elicitation phase during CIA (12). The precise role for IL-17 in the pathogenesis of RA, however, still remains to be elucidated. In this study, using IL-17−/− mice, we assessed the role of IL-17 in the development of CIA. The incidence of CIA was markedly suppressed in IL-17−/− mice, and a crucial role for IL-17 was suggested in activating collagen-specific T and B cells during CIA. IL-17−/− mice were generated, as described previously, using E14.1 ES cells (13). For CIA induction, IL-17−/− mice on (129/Sv × C57BL/B6)F1 hybrid background were used, and the IL-17+/+ littermates were used as the controls. These mice were kept under specific pathogen-free conditions in an environmentally controlled clean room in the Center for Experimental Medicine, Institute of Medical Science, University of Tokyo. The experiments were conducted according to the institutional ethical guidelines for animal experiments and the safety guideline for gene manipulation experiments. CIA in mice on 129 × B6 F1 hybrid background was performed, as described elsewhere (5). Briefly, mice were immunized with 100 μl of 1 mg/ml chicken IIC (Sigma-Aldrich, St. Louis, MO) emulsified with CFA intradermally at several sites into the base of the tail. CFA was prepared by the mixture of 100 mg heat-killed Mycobacterium tuberculosis (H37Ra; Difco Laboratories, Detroit, MI) and 20 ml IFA (Difco). At 21 days after the first immunization, mice were again challenged with collagen/CFA nearby the primary injection site intradermally. Development of arthritis by macroscopic evaluation was determined, as described elsewhere (14). At 60 days after the first immunization during CIA, limbs were fixed with 10% neutral Formalin and were decalcified with 5% formic acid. They were embedded in paraffin, and 5-μm slices were prepared. Sections were stained with H&E. For IIC-specific T cell proliferative response, inguinal lymph nodes (LNs) were harvested from mice at 1 wk after the primary immunization with IIC/CFA. Single cell suspension was prepared, and LN cells (3 × 105 cells/well on 96-well flat-bottom plate) were cultured in the absence or presence of 50 μg/ml denatured chicken IIC for 72 h, followed by incorporation of [3H]thymidine (0.25 μCi/ml) (Amersham, Chalfont St. Giles, Buckinghamshire, U.K.) for 6 h. Then cells were harvested with a Micro 96 cell harvester (Skatron, Lier, Norway), and radioactivity was measured with Micro Beta (Pharmacia Biotech, Piscataway, NJ). IL-17 levels were measured by ELISA, as described previously (13). Monoclonal rat anti-mouse IL-17 and polyclonal biotinylated goat anti-mouse IL-17 Abs (DAKO, Carpenteria, CA) were used as a capture and detection Ab, respectively. HRP-avidin was obtained from BD PharMingen (San Diego, CA), and a tetramethylbenzidine One-Step Substrate System was obtained from DAKO. rIL-17 as a standard reagent was obtained from Sigma-Aldrich. To measure IL-4 and IFN-γ levels, BD OptiEIA ELISA Sets were purchased from BD PharMingen. Sixty days after the first and second immunizations with IIC/CFA, serum was collected. A total of 10 μg/ml IIC in PBS was coated on Falcon 3912 Micro Test III Flexible Assay Plates (BD Biosciences, Oxnard, CA) at 4°C overnight. After washing with PBS, serially diluted serum samples were applied and incubated at room temperature for 1 h. Then the wells were washed with PBS + 0.05% Tween 20, followed by the addition of alkaline phosphatase-conjugated goat anti-mouse IgG1, IgG2a, IgG2b, and IgG3 (Zymed, San Francisco, CA). Alkaline phosphatase activity was measured using Substrate Phosphatase SIGMA104 (Sigma-Aldrich) as the substrate. Results are expressed by the absorbancy at 415 nm. To assess the role of IL-17 in the development of arthritis, the effect of IL-17 deficiency on the development of CIA was examined. As shown in Fig. 1⇓A, the incidence of the disease in IL-17−/− mice was markedly suppressed compared with that in IL-17+/+ mice. 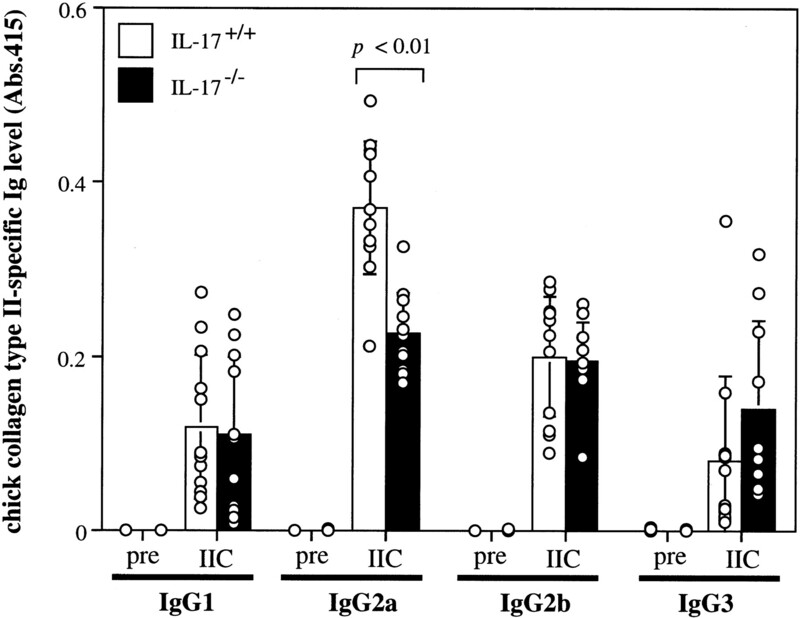 Likewise, the severity score in IL-17−/− mice was also milder than that in IL-17+/+ mice (Fig. 1⇓B). A histological analysis of the joints of IL-17+/+ mice immunized with IIC showed typical features of arthritis, which was characterized by marked synovial and periarticular inflammation with extensive polymorphonuclear cell infiltration, synovial hyperplasia, and bone erosion (Fig. 2⇓, C and E). The articular bone and cartilage were invaded with granulation tissues forming a pannus, and degenerative products of the bone structure were found in the articular cavity. In contrast, the joint pathology of IL-17−/− mice revealed much milder inflammation with profoundly reduced cell infiltration, and synovial hyperplasia and bone erosion were also suppressed, indicating both inflammatory and destructive features of the joints were suppressed in IL-17−/− mice (Fig. 2⇓, D and F). These results indicate that IL-17 is involved in the development of CIA. The reduced development of CIA in IL-17−/− mice. Mice were immunized with chicken IIC emulsified with CFA intradermally at several sites into the base of the tail on days 0 and 21 (arrow). Incidence (A) and severity (B) of CIA are shown. IL-17+/+ mice, ▪ (n = 13) and IL-17−/− mice, • (n = 12). Data obtained from two independent experiments were combined and shown. Average and SD are indicated. ∗, p < 0.005 vs IL-17+/+ mice by χ2 test. †, p < 0.01, and ‡, p < 0.05 vs IL-17+/+ mice by Mann-Whitney U test. Histological analysis in the joint of hind limbs during CIA. Sections of the joint of hind at 60 days after the first immunization during CIA were stained with H&E. The joint of nonimmunized IL-17+/+ (A) and IL-17−/− (B) mice and that of IIC-immunized IL-17+/+ (C and E) and IL-17−/− (D and F) mice. A–D, ×40; E and F, ×100. Because Ab levels against IIC correlate well with the development of arthritis (15), we examined the development of IIC-specific Abs in IL-17−/− mice. Sera were collected 60 days after the first immunization with chicken IIC/CFA, and IIC-specific Ab levels were measured by ELISA. Collagen-specific IgG2a levels in sera from IL-17−/− mice were significantly lower than those from IL-17+/+ mice, whereas the levels of other IgG subclass Abs were not different between IL-17+/+ and IL-17−/− mice (Fig. 3⇓). 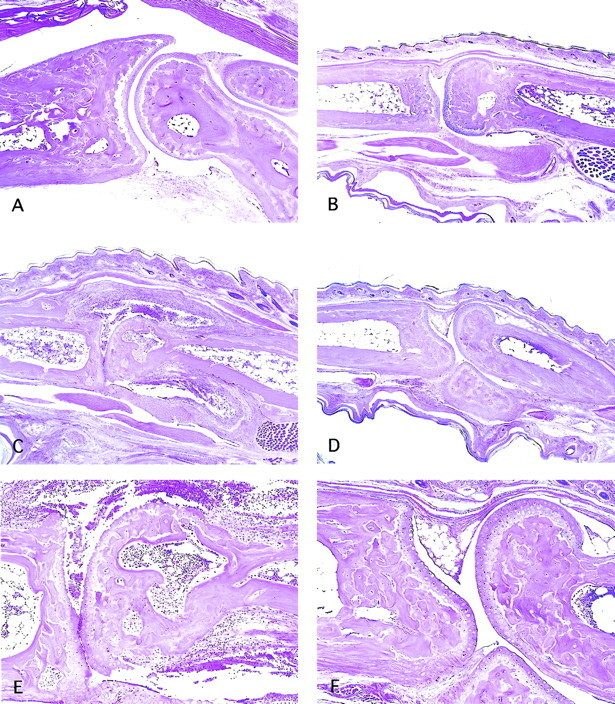 These results indicate that IL-17 is involved in collagen-specific Ab production during CIA. Impaired collagen-specific IgG2a production in IL-17−/− mice during CIA. Before or 60 days after the first immunization during CIA, sera were collected and collagen-specific Ig levels in sera were determined by ELISA. Serum samples were diluted 100-fold. Each circle represents an individual mouse, and an average and SD are shown. IL-17+/+ mice are open columns (n = 13), and IL-17−/− mice are closed columns (n = 12). To elucidate the role of IL-17 in T cell function, we examined T cell response in IL-17−/− mice. A T cell Ag-recalling assay against IIC was conducted 1 wk after the first immunization with chicken IIC/CFA. Proliferative response against IIC of LN cells from IL-17−/− mice was significantly reduced compared with that from IL-17+/+ mice (Fig. 4⇓A), showing that IL-17-deficient T cells are sensitized incompletely. During the incubation, a significant amount of IL-17 was secreted in the supernatants of IL-17+/+ LN cell cultures, but no production was detected in IL-17−/− LN cell cultures (Fig. 4⇓B). IFN-γ production after stimulation with IIC was markedly reduced in IL-17−/− LN cell culture, while IL-4 production was almost undetectable both in the IL-17+/+ LN cell culture and IL-17−/− T cell culture (Fig. 4⇓B). These results indicate that IL-17 plays an important role in the Ag-specific T cell activation during priming phase of CIA. Impaired collagen-specific T cell responses in IL-17−/− mice during CIA. One week after immunization with chicken IIC/CFA intradermally, inguinal LN cells from IL-17+/+ or IL-17−/− mice were cultured in the absence or presence of 50 μg/ml denatured chicken IIC for 72 h. A, Proliferative response was measured by [3H]thymidine incorporation. B, IL-17, IL-4, and IFN-γ levels in supernatants of A were determined by ELISA. Each circle represents an individual mouse, and an average and SD are shown. These results were reproducible two independent experiments. ∗, p < 0.05, and #, p < 0.01. In this study, we showed that, by using IL-17−/− mice, IL-17 is crucial for the activation of autoantigen-specific T and B cells in the sensitization phase of CIA. Various inflammatory cells including T cells are found to infiltrate the local inflammatory site of RA patients, and it has been believed that the T cell-derived Th1 cytokine is involved in the pathogenesis of RA. However, IFN-γ, a major Th1 cytokine, has been considered to play rather beneficial roles (16, 17, 18). In contrast, inflammatory cytokines, TNF-α and GM-CSF, which are also produced by CD4+ T cells (9), are suggested to have an important role in the RA pathogenesis. Indeed, the development of CIA in TNF-α−/− mice (C57BL/6 background) was milder than that of wild-type mice, and markedly suppressed in GM-CSF−/− mice (backcrossed to C57BL/6 for 11 generations) (6). Because both TNF-α and GM-CSF are produced by various cell types including fibroblasts, the suppressive effect of CIA may not solely be a result of their production by CD4+ T cells. However, in a recent study, it was reported that IL-17 is produced by CD4+ T cells that are coexpressing TNF-α and/or GM-CSF, but not by Th1 and Th2 cells (9). Thus, a certain T cell subset, coexpressing IL-17, TNF-α, and/or GM-CSF rather than Th1-producing IFN-γ, may have an important role in the pathogenesis of RA. Although it was believed that contact hypersensitivity response (CHS) is mediated by IFN-γ-producing Tc1 and Th1 cells (19), we showed that CHS was normal in IFN-γ−/− mice (20), while it was markedly suppressed in IL-17−/− mice (13), indicating that CHS as well as CIA are mediated by CD4+ T cells producing IL-17, but not IFN-γ. Moreover, experimental autoimmune encephalomyelitis (EAE) is also considered to be an IFN-γ-producing Th1 cell-mediated inflammatory autoimmune disease. However, many investigators have shown that IFN-γ−/− and IFN-γR−/− mice are highly susceptible to EAE compared with control mice, indicating that IFN-γ-producing Th1 cells are required for the protection of this disease (21, 22, 23, 24). In contrast, IL-17 mRNA was increased in multiple sclerosis, suggesting that IL-17 is involved in the pathogenesis of multiple sclerosis (25, 26). In fact, in our unpublished observation, EAE in IL-17−/− mice was significantly suppressed (Y. Komiyama, S. Nakae, and Y. Iwakura, in preparation). Thus, IL-17-producing T cells rather than IFN-γ-producing Th1 cells play critical roles in the pathogenesis of T cell-dependent autoimmune disease. Recently, it was reported that the administration of IL-17R:Fc fusion protein to DBA/1 mice after secondary immunization with IIC/CFA suppresses the disease by blocking the IL-17/IL-17R binding, suggesting that IL-17 plays an important role in the inflammatory phase (12). In the present study, we have shown that IL-17 is involved in autoantigen-specific T cell priming and expansion (Fig. 4⇑), although the roles of IL-17 in the inflammatory phase are not known in this experiment. Taken together, these observations indicate that IL-17 plays important roles not only in the induction of local inflammation of joints, but also in autoantigen-specific T cell activation in the priming phase. As mentioned above, IL-17 is required for autoantigen- and allergen-specific T cell priming and Ab production (Figs. 3⇑ and 4⇑) (13). Yao et al. (27) also reported that T cell proliferation and IL-2 production induced by PHA, Con A, and anti-TCR mAb were inhibited by soluble IL-17R, indicating that IL-17 is involved in T cell activation. To elucidate the molecular mechanism of T cell activation, we analyzed compartmentalization of T cell subset in lymphoid tissues and DC functions in IL-17−/− mice, and found they are normal (13). Microarchitecture and germinal center formation of the spleen and LNs were also normal in IL-17−/− mice before and after IIC immunization (data not shown). Thus, the precise molecular mechanism of T cell activation by IL-17 still remains to be elucidated. It was reported that C57BL/6 mice produce IgG2c instead of IgG2a, while 129/Sv mice produce IgG2a (5, 28). Although it was suggested that collagen-specific IgG2a contributes to the development of CIA (29), C57BL/6 mice and (C57BL/6 × 129/Sv)F1 mice, but not 129/Sv mice, developed CIA under our experimental conditions (5). Thus, IgGs other than IgG2a might also contribute to the development of arthritis. We showed that collagen-specific IgG2a levels in sera of collagen-immunized IL-17−/− mice were significantly reduced compared with those of wild-type mice (Fig. 3⇑). However, because secondary anti-IgG2a Ab that we used may cross-react with IgG2c, although the efficiency for IgG2c should be much reduced (28), the IgG2a fraction may contain a small fraction of IgG2c in addition to IgG2a. In summary, IL-17 plays a critical role in the development of CIA. These findings may provide a clue to develop novel therapeutics. We thank all the members of the laboratory for their excellent animal care. ↵1 This work was supported by grants from the Ministry of Education, Science, Sports, and Culture of Japan, and the Ministry of Health and Welfare of Japan. ↵2 Current address: Department of Pathology, Stanford University School of Medicine, 269 Campus Drive CCSR 3255, Stanford, CA 94305-5176. ↵4 Abbreviations used in this paper: RA, rheumatoid arthritis; CHS, contact hypersensitivity response; CIA, collagen-induced arthritis; EAE, experimental autoimmune encephalomyelitis; IIC, type II collagen; LN, lymph node. Firestein, G. S., N. J. Zvaifler. 1992. Rheumatoid Arthritis: A Disease of Disordered Immunity Raven Press, New York. Trentham, D. E., A. S. Townes, A. H. Kang. 1977. Autoimmunity to type II collagen an experimental model of arthritis. J. Exp. Med. 146:857. Zanelli, E., M. A. Gonzalez-Gay, C. S. David. 1995. Could HLA-DRB1 be the protective locus in rheumatoid arthritis?. Immunol. Today 16:274. Campbell, I. K., M. J. Rich, R. J. Bischof, A. R. Dunn, D. Grail, J. A. Hamilton. 1998. Protection from collagen-induced arthritis in granulocyte-macrophage colony-stimulating factor-deficient mice. J. Immunol. 161:3639. Campbell, I. K., J. A. Hamilton, I. P. Wicks. 2000. Collagen-induced arthritis in C57BL/6 (H-2b) mice: new insights into an important disease model of rheumatoid arthritis. Eur. J. Immunol. 30:1568. Campbell, I. K., K. O’Donnell, K. E. Lawlor, I. P. Wicks. 2001. Severe inflammatory arthritis and lymphadenopathy in the absence of TNF. J. Clin. Invest. 107:1519. Feldmann, M., F. M. Brennan, R. N. Maini. 1996. Role of cytokines in rheumatoid arthritis. Annu. Rev. Immunol. 14:397. Aggarwal, S., A. L. Gurney. 2002. IL-17: prototype member of an emerging cytokine family. J. Leukocyte Biol. 71:1. Infante-Duarte, C., H. F. Horton, M. C. Byrne, T. Kamradt. 2000. Microbial lipopeptides induce the production of IL-17 in Th cells. J. Immunol. 165:6107. Ziolkowska, M., A. Koc, G. Luszczykiewicz, K. Ksiezopolska-Pietrzak, E. Klimczak, H. Chwalinska-Sadowska, W. Maslinski. 2000. High levels of IL-17 in rheumatoid arthritis patients: IL-15 triggers in vitro IL-17 production via cyclosporin A-sensitive mechanism. J. Immunol. 164:2832. Aarvak, T., M. Chabaud, P. Miossec, J. B. Natvig. 1999. IL-17 is produced by some proinflammatory Th1/Th0 cells but not by Th2 cells. J. Immunol. 162:1246. Lubberts, E., L. A. Joosten, B. Oppers, L. van den Bersselaar, C. J. Coenen-de Roo, J. K. Kolls, P. Schwarzenberger, F. A. van de Loo, W. B. van den Berg. 2001. IL-1-independent role of IL-17 in synovial inflammation and joint destruction during collagen-induced arthritis. J. Immunol. 167:1004. Nakae, S., Y. Komiyama, A. Nambu, K. Sudo, M. Iwase, I. Homma, K. Sekikawa, M. Asano, Y. Iwakura. 2002. Antigen-specific T cell sensitization is impaired in IL-17-deficient mice, causing suppression of allergic cellular and humoral responses. Immunity 17:375. Saijo, S., M. Asano, R. Horai, H. Yamamoto, Y. Iwakura. 2002. Suppression of autoimmune arthritis in interleukin-1-deficient mice in which T cell activation is impaired due to low levels of CD40 ligand and OX40 expression on T cells. Arthritis Rheum. 46:533. Seki, N., Y. Sudo, T. Yoshioka, S. Sugihara, T. Fujitsu, S. Sakuma, T. Ogawa, T. Hamaoka, H. Senoh, H. Fujiwara. 1988. Type II collagen-induced murine arthritis. I. Induction and perpetuation of arthritis require synergy between humoral and cell-mediated immunity. J. Immunol. 140:1477. Matthys, P., K. Vermeire, T. Mitera, H. Heremans, S. Huang, D. Schols, C. De Wolf-Peeters, A. Billiau. 1999. Enhanced autoimmune arthritis in IFN-γ receptor-deficient mice is conditioned by mycobacteria in Freund’s adjuvant and by increased expansion of Mac-1+ myeloid cells. J. Immunol. 163:3503. Wang, B., H. Fujisawa, L. Zhuang, I. Freed, B. G. Howell, S. Shahid, G. M. Shivji, T. W. Mak, D. N. Sauder. 2000. CD4+ Th1 and CD8+ type 1 cytotoxic T cells both play a crucial role in the full development of contact hypersensitivity. J. Immunol. 165:6783. Ferber, I. A., S. Brocke, C. Taylor-Edwards, W. Ridgway, C. Dinisco, L. Steinman, D. Dalton, C. G. Fathman. 1996. Mice with a disrupted IFN-γ gene are susceptible to the induction of experimental autoimmune encephalomyelitis (EAE). J. Immunol. 156:5. Willenborg, D. O., S. Fordham, C. C. Bernard, W. B. Cowden, I. A. Ramshaw. 1996. IFN-γ plays a critical down-regulatory role in the induction and effector phase of myelin oligodendrocyte glycoprotein-induced autoimmune encephalomyelitis. J. Immunol. 157:3223. Matusevicius, D., P. Kivisakk, B. He, N. Kostulas, V. Ozenci, S. Fredrikson, H. Link. 1999. Interleukin-17 mRNA expression in blood and CSF mononuclear cells is augmented in multiple sclerosis. Mult. Scler. 5:101. Lock, C., G. Hermans, R. Pedotti, A. Brendolan, E. Schadt, H. Garren, A. Langer-Gould, S. Strober, B. Cannella, J. Allard, et al 2002. Gene-microarray analysis of multiple sclerosis lesions yields new targets validated in autoimmune encephalomyelitis. Nat. Med. 8:500. Yao, Z., W. C. Fanslow, M. F. Seldin, A. M. Rousseau, S. L. Painter, M. R. Comeau, J. I. Cohen, M. K. Spriggs. 1995. Herpesvirus Saimiri encodes a new cytokine, IL-17, which binds to a novel cytokine receptor. Immunity 3:811. Martin, R. M., J. L. Brady, A. M. Lew. 1998. The need for IgG2c specific antiserum when isotyping antibodies from C57BL/6 and NOD mice. J. Immunol. Methods 212:187. Hirofuji, T., K. Kakimoto, H. Hori, Y. Nagai, K. Saisho, A. Sumiyoshi, T. Koga. 1985. Characterization of monoclonal antibody specific for human type II collagen: possible implication in collagen-induced arthritis. Clin. Exp. Immunol. 62:159.